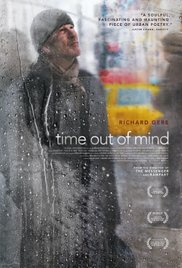 After watching “Time out of mind” I felt pity and at the same time a kind of relief coming over me. I pitied George who tries to escape the cold daily by hiding in the waiting room of a hospital or just riding the subway through New York. Pity because he always has to find himself a new coat to withstand the freezing cold because he traded his last one in a pawnshop for a bit of cash again. Pity because usually this money is needed to buy some cheap alcohol. And pity because it’s difficult for homeless people to pick up the thread again or to be in order with the bureaucratic whirligig. And in addition, I felt this relief because I’m not living in such a hopeless situation and I don’t need to struggle for survival all the time. Relieved because I do possess what these homeless people are missing. My greatest admiration goes out to Richard Gere who succeeded seemingly effortlessly in changing into a person who’s standing on the precipice of society. Despite George’s unshaven and scruffy appearance, you still can catch a glimpse of Gere’s good looks and seductive gaze at times. Even the social assistant who interviews him notices that. But Gere wasn’t the most obvious choice in my opinion. It’s the most contrarian part he could play, compared to his previous acting. George is the opposite of the characters he played in “American Gigolo” and “Pretty Woman“. As Gere himself in real life, these characters are wealthy and without deficiencies. And still Gere manages to come across as the poor man who can’t find a way out of the vicious circle he finds himself in. In other words, I’m starting to like the actor Gere more and more. Maybe it has to do with his age. Just like in “The Benefactor” it’s not an obvious role or something to get credits for in an easy way. The only weak point in “The Benefactor” was the story on its own. Gere’s acting on the other hand was sublime and admirable. The story may seem rather long-winded, with a lot of boring intervals. However, it felt like the image sought to include George’s everyday life. A useless existence with many moments where he’s observing things expressionless, dozing off once and a while and patiently waiting untill he can return to the safe city center for the homeless. Not that George stays there with conviction and pleasure. In his eyes, this is probably the low point in his sad life and he tried to avoid it as long as possible. The New York city life serves as a soundtrack. Bits of music you can hear from a random bar, followed by a random conversation held by a stranger on the phone or the loud music from a passing car. And this interspersed with images taken from afar out of different angles where we see George as a key figure in the center of this cacophony. A symbolic image that shows how insignificant he is as a person in this metropolis. You can hardly call this movie a real crowd puller. And many who saw it, will probably claim that it’s slow and monotonous. And although that was also my first impression, the film gradually fascinated me more and more. It’s been a long time since I enjoyed an interaction between two totally different people like the one here with George and Dixon (Ben Vereen), an ancien among the homeless whose blabbering starts to annoy George from the beginning. Everyone will recognize Ben Vereen from a TV movie, but he was really unrecognizable in this movie. Although the attempt to pick up the thread again when it concerns his daughter Maggie (Jena Malone), this part of the story seems to become less important in relation to the larger whole. The way the movie ends seems simplistic and minimalistic. And yet the end fits perfectly with the rest of the film. “Time out of mind” at least impressed me.